Few early western cities escaped the ravages of fire, and the town of Anderson was no exception. In 1887, a fire erupted on the East side of town. With no fire department to control it, the flames quickly spread to nearby buildings. 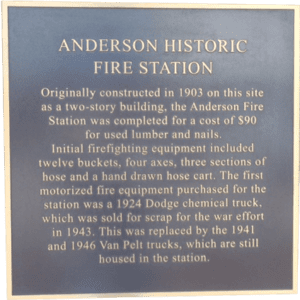 A citizen’s bucket brigade managed to stop the fire, but not before most of Anderson (Including two of the three hotels) were destroyed. The damage amounted to over $75,000.00, with only one quarter of that insured. 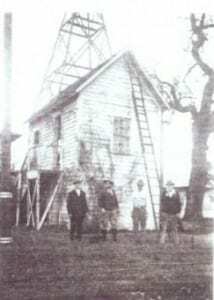 Anderson was rebuilt, but a fire department was needed to ensure that the town would not be destroyed again by fire. On October 9, 1889, twelve of Anderson’s early residents met at the old Bedford & Wright store at the corner of North and East Center Streets for the purpose of establishing the first fire company (Known as the “Anderson Hose Company No. 1”). 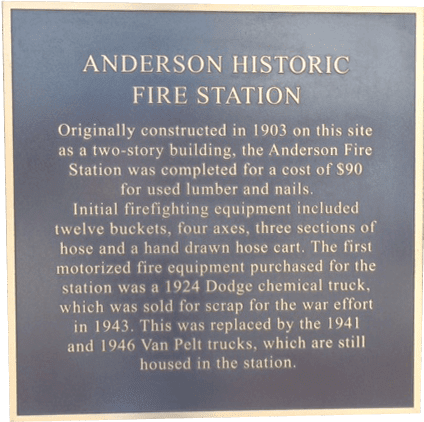 On July 10th, 1909, the Shasta County Board of Supervisors appointed the first Board of Fire Commissioners for the town of Anderson, and the name was changed to the “Anderson Fire Protection District” (The name of the present-day fire department). The Anderson Fire Protection District currently encompasses the City of Anderson (incorporated 1956), and extends North of the city limits as far as the Verde Vale Subdivision. In 1959, the department moved into its present-day location at 1925 Howard St (Next to the Anderson City Hall). The department acquired its first paid personnel in 1959. The department started with three personnel in 1959, and had increased its staffing level to 6 by 1970. During 1950, the department responded to 250 incidents which included fires and medical aids. During the 2009 calendar year, the department responded to over 2089 incidents with the same staffing level as in 1970. In 2010, the Anderson Fire Protection District once again made history by having the first fully elected fire board. The 5 members of the board were elected by the citizens of Anderson. In 2010, the fire district hired 3 full time firefighters to work alongside the 3 full time captains. For the first time in Anderson’s history, the community is protected by 2 full time personnel 24 hours a day, 365 days a year.